Purim is such a creative time. It speaks right to my soul. You get to come up with fun costume ideas, mishloach manot and sometimes even party themes! For me, the most fun part is coming up with one-of-a-kind hamantaschen ideas. Last year I had so many hamantaschen ideas—shakshuka, strawberry shortcake and chicken pot pie, just to name a few—that I was worried I would have trouble coming up with anything new this year! While I tossed and turned last night with jetlag and eventually woke up (super late) on New York time, I came up with a brilliant hamantaschen-for-breakfast idea! So much focus goes into the Purim Seudah that we don’t give any thought to Purim breakfast, and after all breakfast is the most important meal of the day. We have a super packed day ahead of us with giving out mishloach manot and preparing for the seudah, so a delicious and filling breakfast is definitely in order. Enter the crêpe hamantaschen. Crêpes are soft and pliable which makes for easy folding, unlike pancakes, plus they taste at least a million times better (IMHO). They also go so well with so many different fillings and toppings, so it’s customizable for everyone in the family! 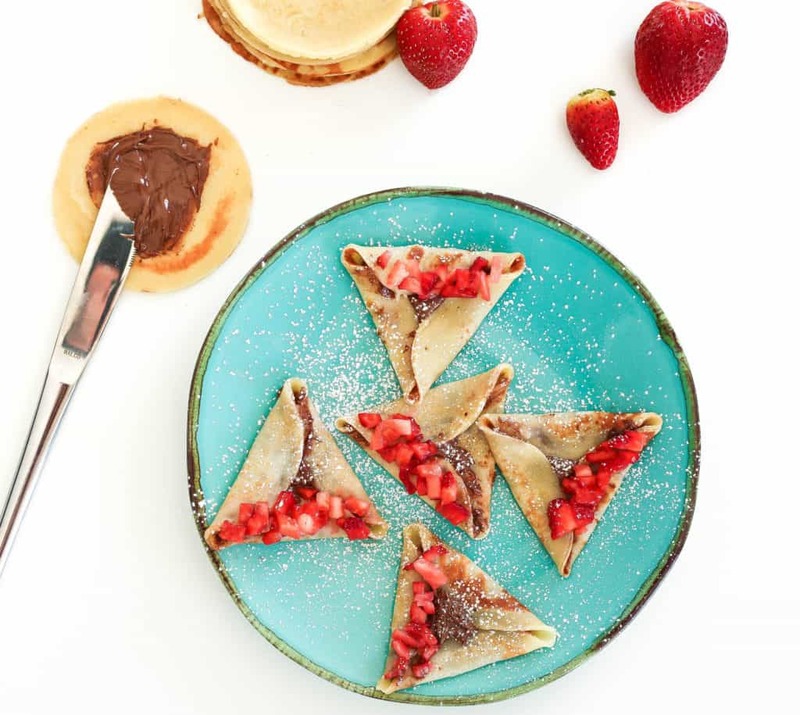 Surprise your kids on Purim morning with these treats for breakfast and I bet they will be much more inclined to help you out with all the crazy festivities of the rest of the day. In a mixing bowl, whisk together the flour, sugar and the eggs. Gradually add in the milk and water, whisking to combine. Add the salt and butter; beat until smooth. Heat up a nonstick frying pan over a medium flame. Lay down a few 3-3.5 inch round egg/pancake molds, making sure they lay flat. Pour a small amount of batter into each mold, using a small spoon to evenly spread out the batter to create a thin layer. Fry the crepe for about 2 minutes, until the bottom is golden. Loosen from the mold with a spatula, remove the mold, and flip the crepe. Repeat until all the batter is finished. 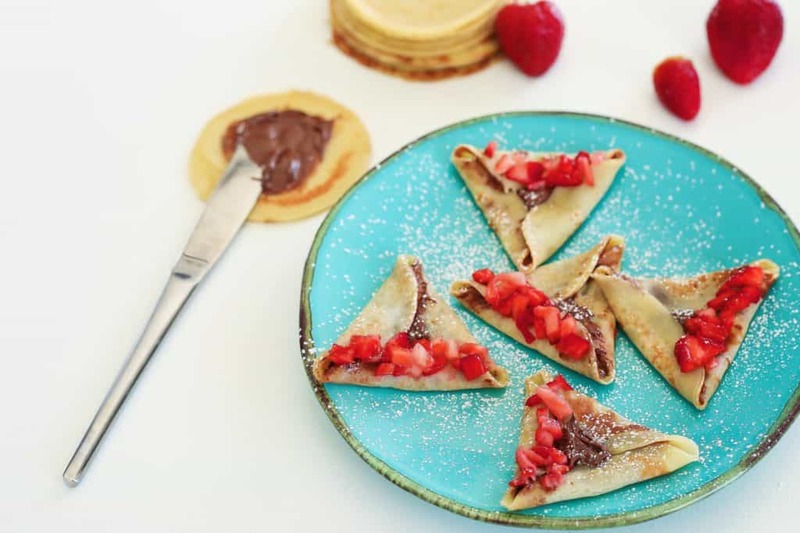 Spread Nutella or any other spread over the middle of the crepe, fold over like a hamentaschen* and add any toppings you like. Fold over one edge of fold over the opposite edge to overlap the first and create a point. Use some spread as 'glue' to secure it. Fold over the bottom edge over the other two edges to create the remaining two points in a triangle, use spread to 'glue' it into place.